Prime's goal is for all campers to leave camp as more knowledgeable and skilled athletes then when they started camp. The best way to achieve that goal is to instill the values of hard work, a positive attitude, and most importantly, having fun. Prime campers will walk away at the end of camp(s) confident and skilled athletes. We understand that parents work earlier or later than the time of camp, therefore we are offering extended care at (or nearby) the facilities. Extended care must be arranged in advance. Please email primeyouthsportscamps@gmail.com with any questions or to make arrangements for extended care. 1– Prime will have additional t-shirts and accessories for sale during all camps. 2– Prime will have a small Snack Bar available for kids to buy additional snacks if they forget a lunch or need extra food. Kiki and Diane will coach and/or oversee all camp sessions. 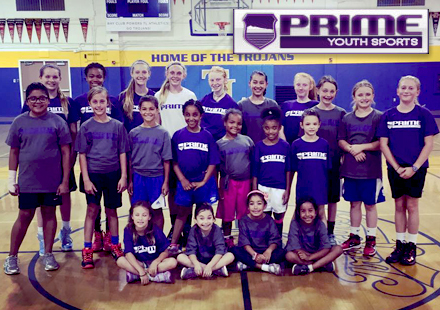 In addition, Prime has recruited former and current top female athletes to be camp coaches at Prime's various camps. 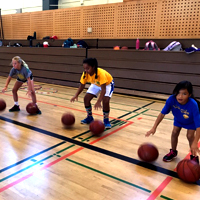 Not only do we want the campers taught by women so they can learn from other successful female athletes, but we want to bring in the top athletes so all campers can have a positive experience learning the proper skills from the coaches. • Prime T-Shirt and other Prime accessories! Campers should dress appropriately for sports play. For basketball camps, campers are encouraged to wear high-top basketball shoes if they have them. 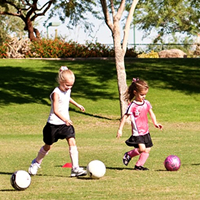 For the outdoor camps, please bring tennis shoes and any soccer/field cleats if the camper has them. — Prime's number one priority is to make sure that all players feel safe at camp. Along those lines, Prime will make sure that all drills and games are played according to the rules and as safely as possible so injuries can be avoided. — A first aid kit will be present and available at all camps for any injuries that do occur while at camp.